My mum will be seventy this year, but she cuts a sprightly figure as she steps across the rocks at Castle Beach. In a rare, precious moment we have time together, surrounded by glittering pools and a wide open bay. 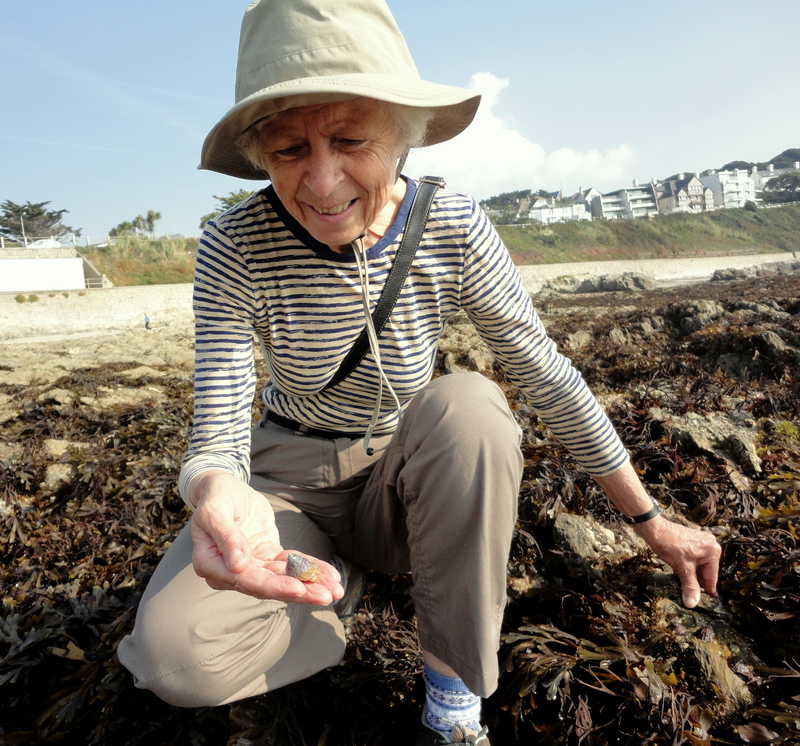 Rockpooling with Mum, Castle Beach, Cornwall. These are the moments we hoped for not so many years ago when Mum was lying in a hospital bed, hooked up to a blood transfusion to give her the strength to make it through her cancer operation. For a while, hope was all we had. Here on the beach only the tides mark the passing of time. Our conversations are as they always were, with Mum reeling off the news of a village I left twenty years ago. The vintage rally was a great success. Mr and Mrs C. have moved house. The trees have been chosen for the community orchard. What do I think of plans to build a new free school? 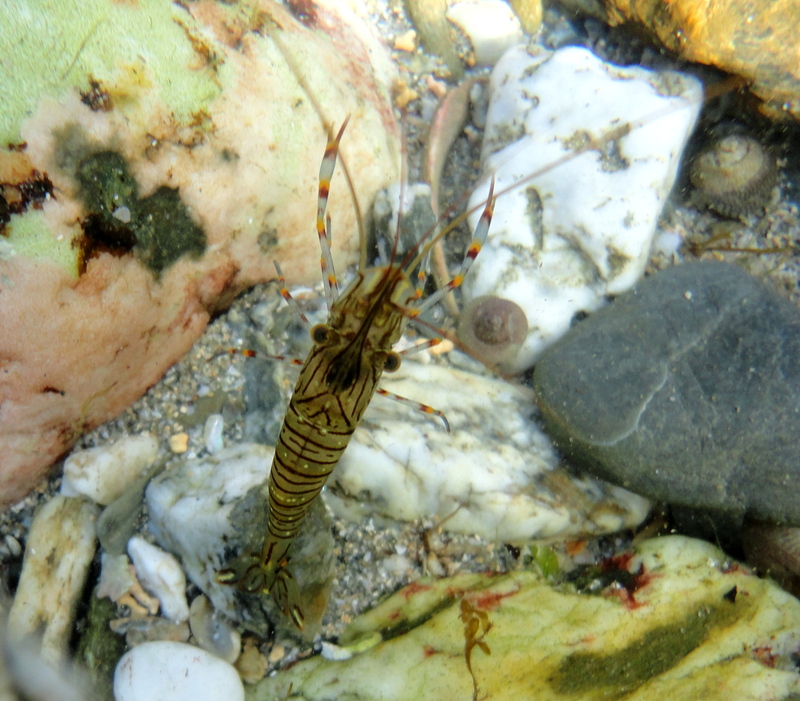 Tiny gobies and prawns dart across the sand and we lift back seaweed to find plump strawberry anemones and red-eyed crabs. I clamber into the pools and plunge my camera in the water while Mum waits on the rocks, chatting and examining a pink painted topshell. Its spire has worn down to reveal glimpses of a turquoise, mother of pearl lining. 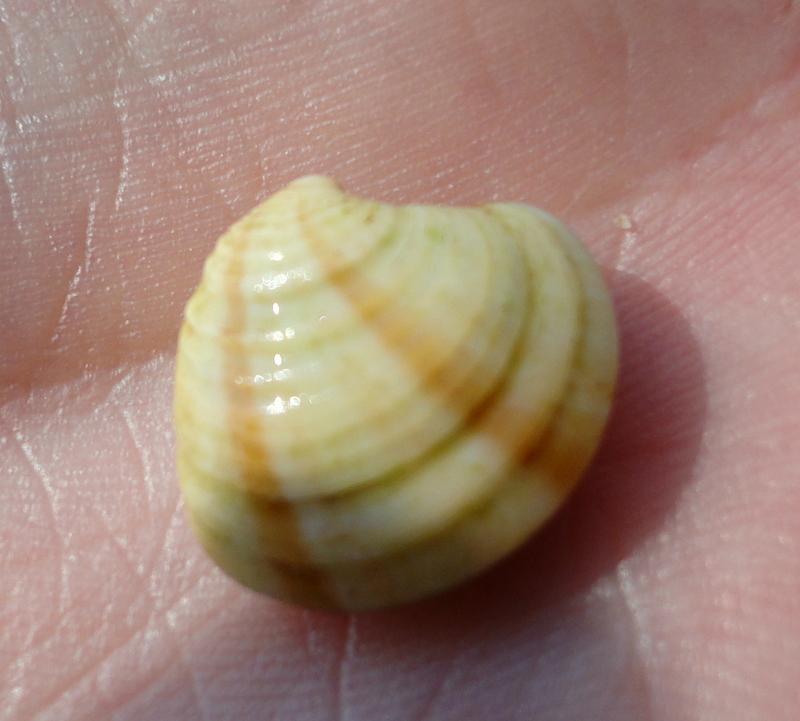 Mum holding a painted topshell. Young dragonets zip from one resting place to the next, so perfectly camouflaged that they disappear before I can point them out. “What do they look like?” Mum asks, peering into the crystalline shell sand. She shakes her head and I take some photos to show her later. See me now? 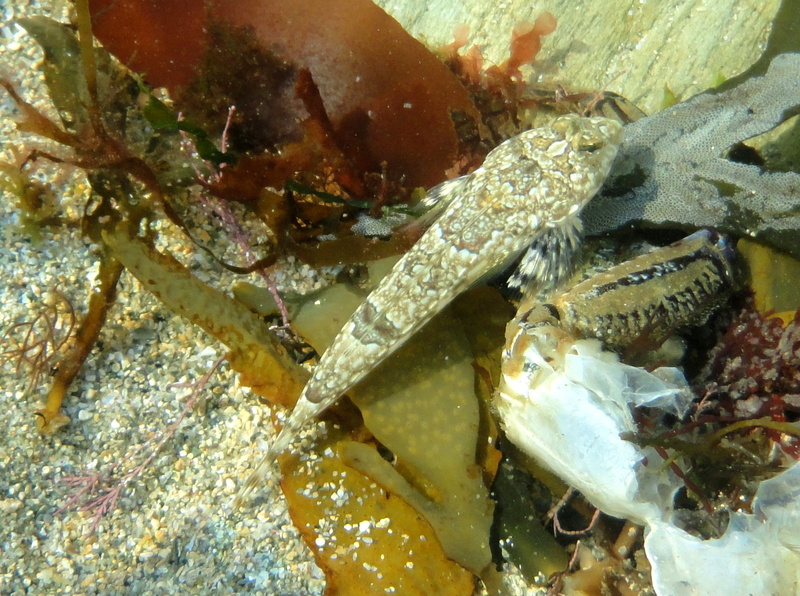 A dragonet at Castle Beach. 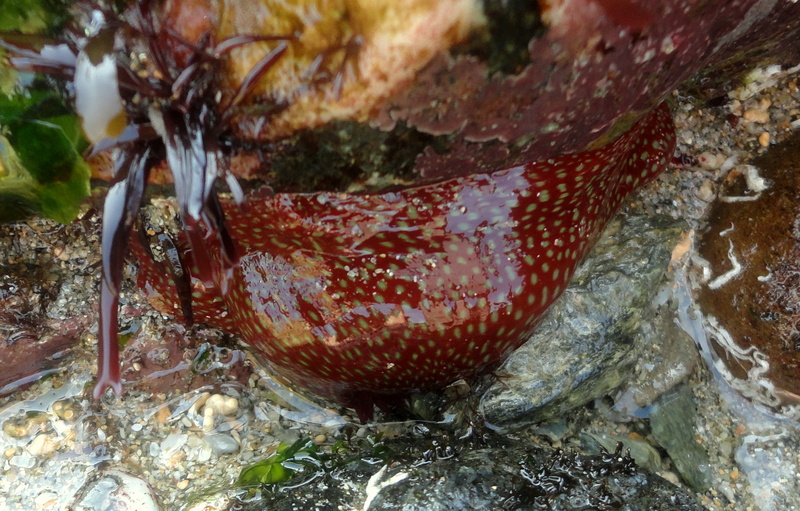 Mum holds a cushion starfish we find under a ledge, turning it over to watch its tentacle feet reaching out. 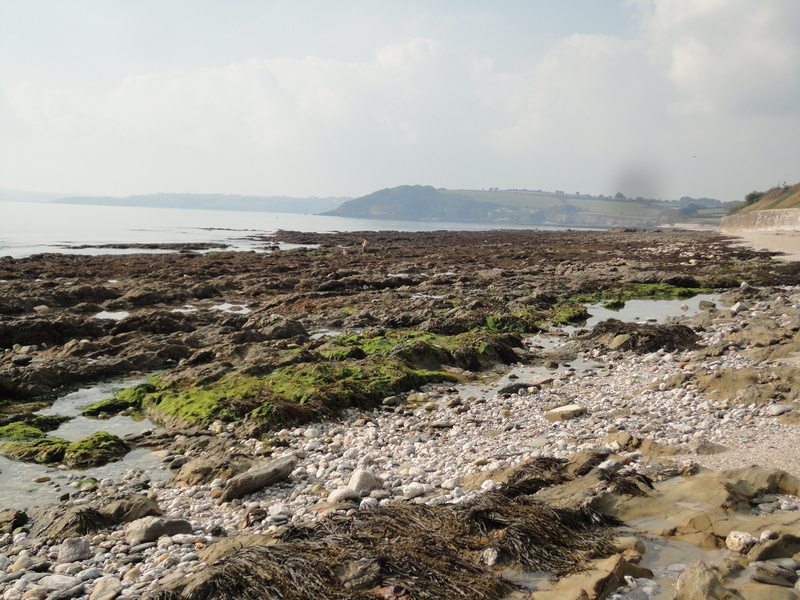 I take a video as it glides across the stones by my feet to the shelter of some seaweed. The water is so clear I can film from the surface. 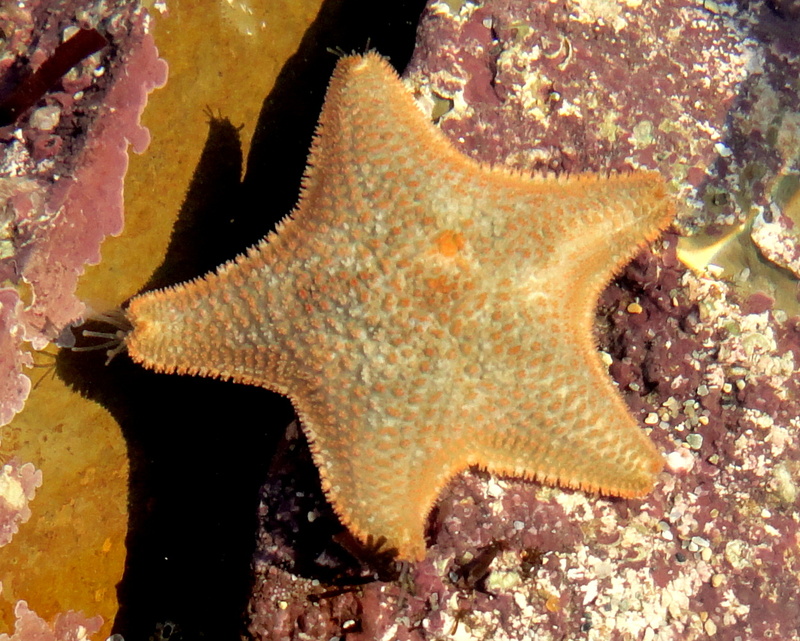 Cushion star on the move – reaching out with its tentacle feet. The sun is high now and in another half hour the noon-day gun will boom out from Pendennis Castle on the hill above us. We pick our way back to where Dad and my little boy are playing on the sand, stopping to watch the fish and to examine shells as we go. 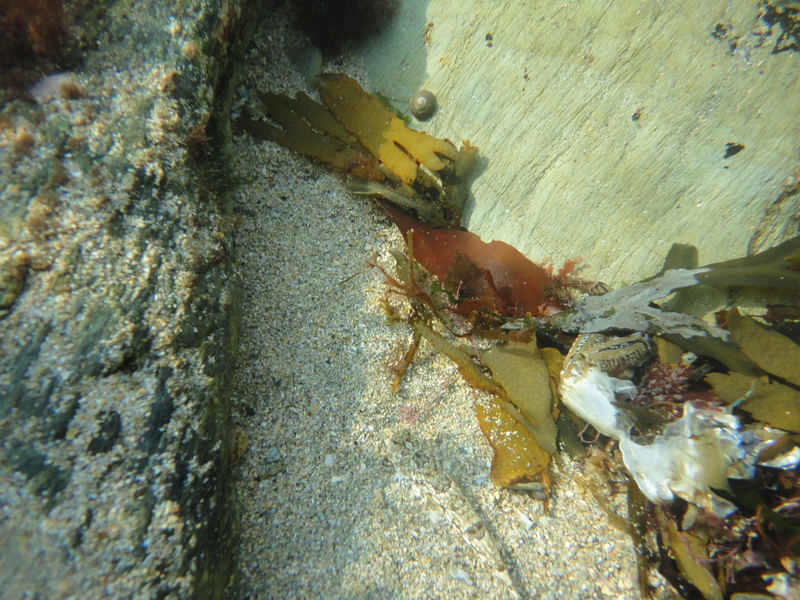 While Mum and Dad enjoy a tea at the beach café, I take a dip in the warm autumn waters, above kelp and corkwing wrasse. I wave towards the shore, but my son is too absorbed in his games to notice me. Rock pools at Castle Beach. I turn and float on my back, my eyes closed, letting the rippling ocean carry me. Soon, life will fill up again with deadlines, chores and challenges, but this moment is all I need to carry me through. Happiness is about appreciating the simple things. I learnt that from my mum. 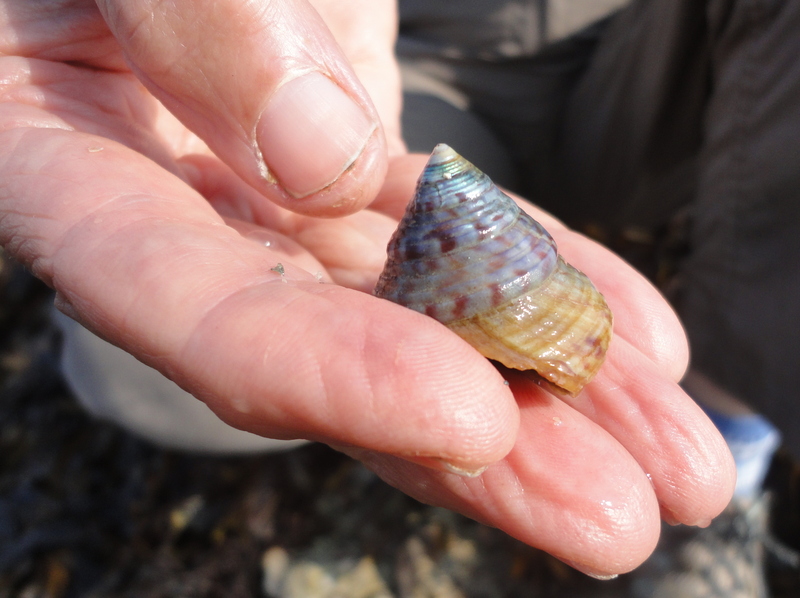 Mum holding a banded venus shell. Another post that’s so vivid to read that I can almost taste salt on my lips. More fab pics too. I really look forward to your posts, I hope the winter months won’t bring a complete end to them. Thank you for your lovely comments, CBR bound. Don’t fear, I’m a hardy all-weather rockpooler. I’m rather looking forward to getting back into my waders to see what the winter storms wash up. Great pictures (and story.) The strawberry anemone is cool looking!